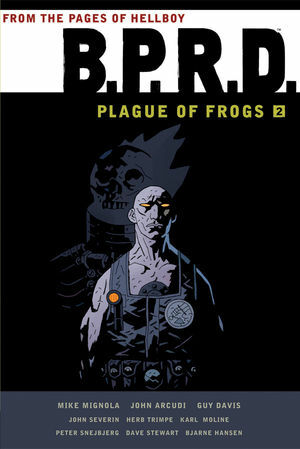 This collection contains Volume 4, 12 and 5 of BPRD Plague of Frogs. Picking up right where the last collection left off and with the addition of Arcudi (writer) this story explodes with changes from the bureau! Abe is off finding himself in Rhode Island with Kate, while Liz and the others find themselves in the command of a new Captain, Daimio, who takes them to anew headquarters. Both Mike Mignola and John Arcudi do a fantastic job living up a series that needed no help doing so. Captain Daimio finds it difficult adjusting to his new unconventional coworkers while Johann Kraus goes exploring the new space, discovering secrets better left hidden. Theover-arching Plauge of Frogs offense wanes and ebbs under the bureaus constantbarrage. They seem all but beaten when a new villain takes the helm and leads them to one of the biggest treacheries to come to BPRD! Thefresh arrival of John Arcudi helping Mignola shows to only be benefit theseries in ways I couldn’t imagine. BPRD has come into its own, stepping out of the shadow of Hellboy and becoming one of the great ones to read. As always Guy Davis continues to do a great job on the book, along with help from some other artists mentioned above. None really stick out to me personally, but they do a fine job. For starters these omnibus collections may not have the same succession of volumes as the trade papers (this one did, it’s volume 1-3). Editors might have mixed up the numbers or added additional content for the hardcover omnibus to give the story better flow. Something very confusing when you try to collect all volumes of this title. For a detailed explanation go to this site. This is a Hellboy story without Hellboy. It takes place after Big Red took a leave of absence from the bureau. The readers get a chance to dive into the Hellboy universe and shine the spotlight on some of the supporting characters, notably my favorite: Abe Sapien. This book stays true to Hellboy nature, even referencing books of his own series giving you context. Mignola has his hand still in the universe but leaves the artwork to a cast of varying artists. Some I love more than others but the main artist is Guy Davis, who does a great job. Readers take an adventure on a monster an issue basis, almost like X-Files with a creepier take Mulder and Scully. In the last couple issues we get the namesake story exploring a war of large deformed frog monsters that creates an outline for the upcoming books. The ending of the book also explores the origin story of a very important character; something that continues into omnibus volume 2 (I won’t spoil it for you). BPRD is a great read if you are itching for more Hellboy and Mignola; and honestly who isn’t? Interested in more reviews? Check out my Facebook page!